A new installation uses a profile called ‘Bodhi Linux’. Unless you’ve since applied a different profile, any tweaks you’ve made to your desktop are stored in that. If you wish to save the current state of your customizations, perhaps because you think you might want to return your desktop to that state at a later date, or because you want to copy all those customizations to a Bodhi system running on another computer, you can do so at the Profile Selector dialog box (go to Main menu > Settings > Settings Panel > Profiles). Click ‘Add’ at this dialog box, and enter a name of your choice. Note though that you will still be using the ‘Bodhi Linux’ profile, NOT your newly-added one, and any further customizations that you make will be stored in ‘Bodhi Linux’. If you want to use instead your newly-added profile, you must highlight it at this dialog box and click ‘Apply’. It will then be the active profile, storing any subsequent customizations. Here’s an example of the use of profiles. If you are thinking of experimenting with your current theme by applying a variety of fonts and colors to the various elements of the desktop, it might be worth saving your profile first. To return to the previous settings for fonts and colors (perhaps because you’ve decided to use a different theme which doesn’t work with your new choice of colors), simply apply your previously-saved profile. Each profile has its own folder in the hidden folder .e/e/config in your home directory. (To see hidden folders, press Ctrl+H in your file manager.) 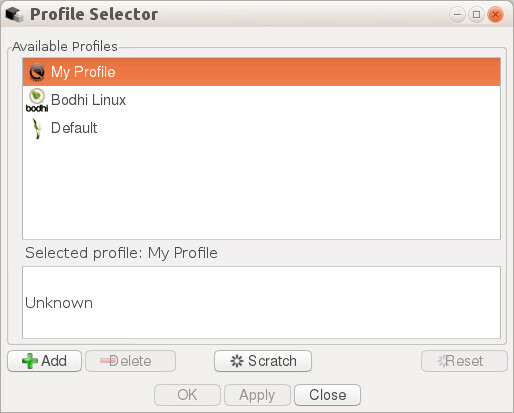 If you wish to apply a profile to another computer running Bodhi 3, simply copy its folder to the same location on the other computer, then open the Profile Selector dialog box on that system and apply it.